"tricks of the trade" to make life easier. 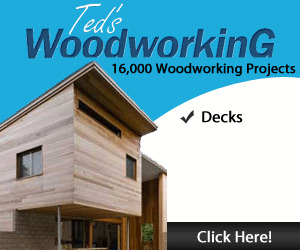 Woodworker's Journal readers share their techniques — and we share other readers' reactions. This simple addition to my table saw required under $6 in materials and took about 30 minutes to complete. It allows me to safely and conveniently hit the off switch with my knee or shin while my hands are holding the stock. A light tap anywhere on the 1/2" PVC frame does the trick and the large open frame does not obstruct access to the on switch or the blade height crank. My saw is a Grizzly Cabinetmaker; however, most any make can be accommodated with slight alterations to the basic scheme. There is a picture of a mess of pipes which the owner said helps him to control his saw. Never would I add such a rig of pipes to my saw or other machine. I guess he never thought that his jacket button or string could cause the saw to start when not wanted. This is my thought about the rigging: no thanks. WJ Responds: Theo, J.D. Carlson's rigging only makes contact with the "off' button. Jig for Mitered Corners A Bevel or a Miter? My old contractor's saw needed help cutting accurate miters, so I designed this jig. Start with a keyed plywood base of 3/4" thick stock. 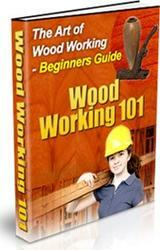 Lower the blade below the table top and make sure the plywood slides smoothly. Raise the blade and cut the side absolutely parallel to the blade. Cut two matching sides to about 48° and glue these to the base, holding their tips to the saw-cut parallel edge. 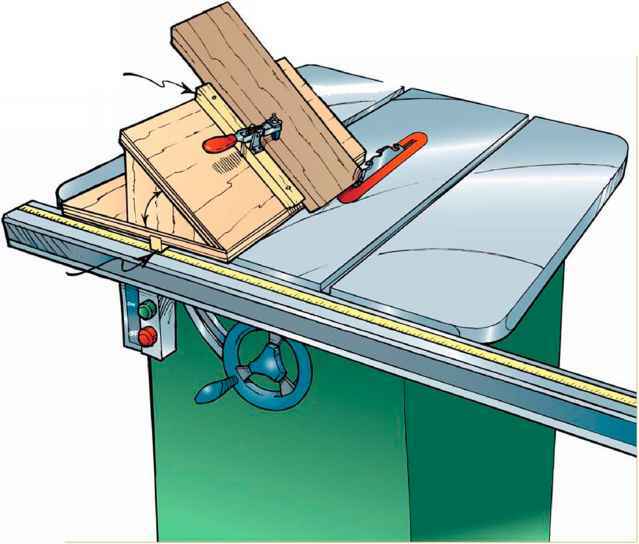 With a steel square, mark a line on the jig at 90° to the blade and add a fence for registering the edges of your stock. Now till the blade just a bit until you have a perfect 45° angle for your cuts. Remember to reset the blade to vertical after using the jig. The "Jig for Mitered Corners" is worded wrong: it should be called the "Jig for Beveled Corners." 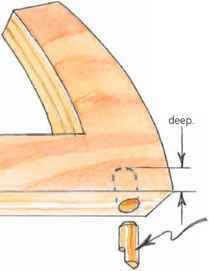 Everywhere he mentions a miter, it is actually a bevel cut. It does look like the jig would be helpful to use for 45° bevels. I like the issues of y'all's magazine. Most of them have some good stories or furniture plans. WJ Responds: OK, the cuts he's making are bevels — since a bevel is an angle that isn't a right angle. But, since the picture showed Carl Allen's jig cutting a 45' bevel, it's still a jig for mitered joints. Really. Edge joints at any angle besides 45 are beveled joints, but when you put 45° joints together to make a joint, it's mitered. (You can look this up in Ernest Joyce's Encyclopedia of Furniture Making.,) Who said language had to make sense? If it's any comfort to you, we're pretty sure mitered corners do receive a special blessing: why else would the pope use the name for his hat ? Don't discard that old pole lamp with the push-button switch on the base. With simple modifications, this fixture will free your hands from reaching under a router table or saw to turn the machine on and off. Mount a two-gang receptacle on the base, wiring it to the switch and adding a power cord with a plug to reach an outlet. Insert the plug into a hot outlet and plug your machine's cord into the receptacle mounted on the lamp shroud. With a slight tap of the foot on the base-mounted switch, you'll start the machine. This is a very dangerous practice. Some shop equipment draws 20 amps or more to start and runs at 10 to 20 amps. Most of the old switches are not rated for this much current and are not spark proof. 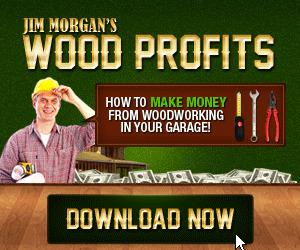 You know how sawdust builds up everywhere. Replace the switch with a newer switch rated for the amperage and seal it so it won't start a fire, and then this is not such a bad idea. I have enclosed a picture of my tool stand. Please send my thanks to Wendell Smith of Oregon, Wisconsin. I've found mine to be very useful so far. And by the way, your magazine has been very inspiring. My tool stand is the handiest item in my shop: there's always a place to lay the tool I'm using. Each shelf has 1M" edges all around it to hold items in place. The bottom has three sides with 4" walls. 'Hie shelves on the inside of the upright (not shown) have a good amount of storage space for belts and discs. A 12-foot electric cord on the back can reach any plug in the shop and can hang in the back when not in use. Casters make the rack very moveable. 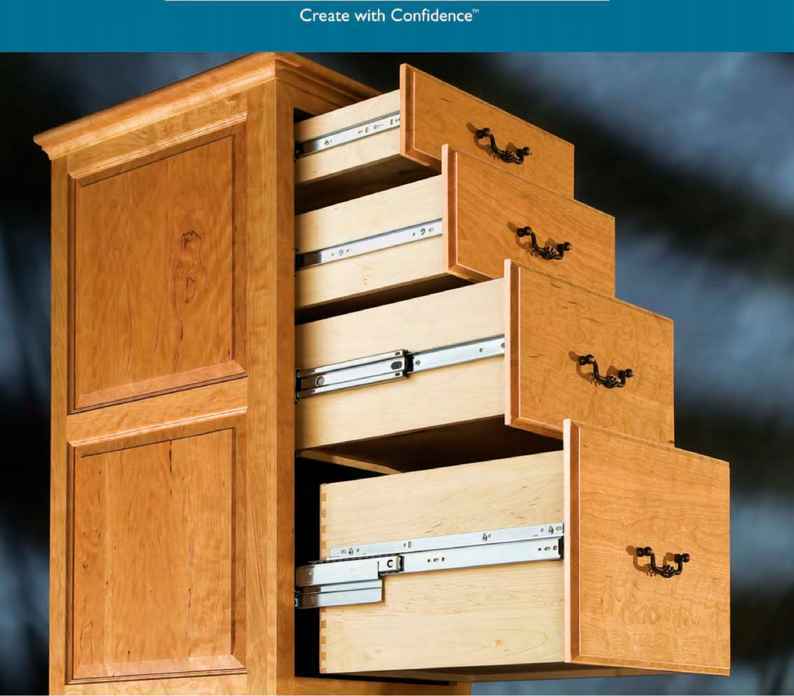 Increase performance (not your budget) with Rockier TopSlide ball-bearing drawer slides. They open drawers more smoothly, close them more quietly, and offer more reliability than any leading alternative — all with lower average prices. More for less: another way Rockier helps you Create with Confidence. 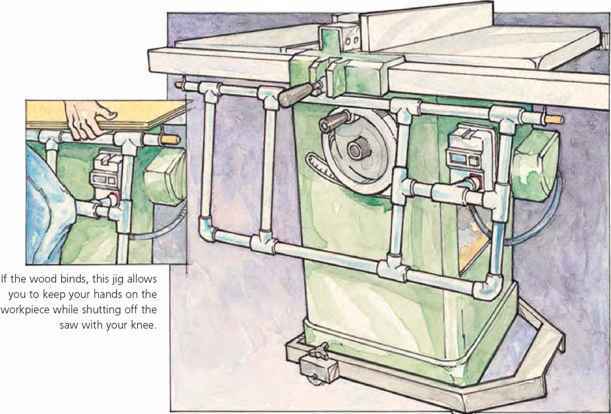 With this mobile base I can easily move my contractor's table saw around — even down steps or over door thresholds. I use the table saw fence rails wheelbarrow-style so I don't have to bend down. The wheel and axle are from a child's bicycle and the remainder shop scrap. Be sure to engage the wooden "hook" before moving the saw. First, let me say I love your magazine and read it cover to cover each time. I have found it very helpful many times. 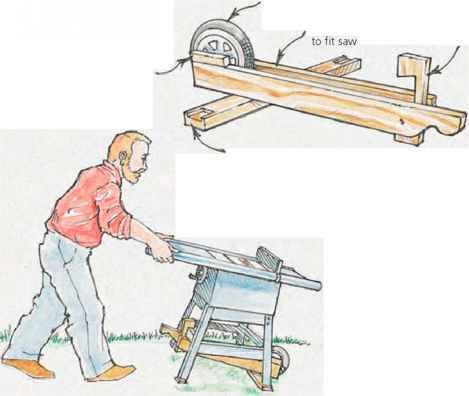 Paul McKibben said to use fence rails to lift the saw. My Craftsman table saw has a large sticker on the fence rails that states, "Do not lift by the fence rails." I'm sure many other saws state that. We have purchased a wheel kit to move our saw around and push it by its base, not the fence rails. I like to make push sticks that not only do their job but also feel comfortable to the hand. This takes a little time and then, sooner or later, you cut the step or notch away and have to make a new one. My new model push stick has a short piece of hardwood dowel with a flattened aspect on its forward surface, as shown below. When it wears down, I just drill out the old dowel and replace it with a new one — a couple of minutes' work. Just read my first copy of the magazine. Ken Collier's push stick can be improved simply by drilling a 1/4" diameter hole all the way through from the 1/2" hole. Mien the dowel needs replacement, knock it out with a punch or nail. Repealed drilling will ruin the hole. Form a flat surface on one side of the dowel. 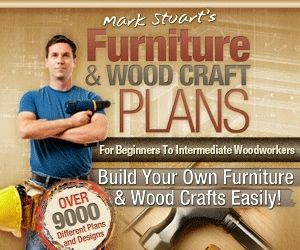 Selected from the archive of Woodworker's Journal, this new series gathers classic projects and expert instruction into one easy-to-access collection. 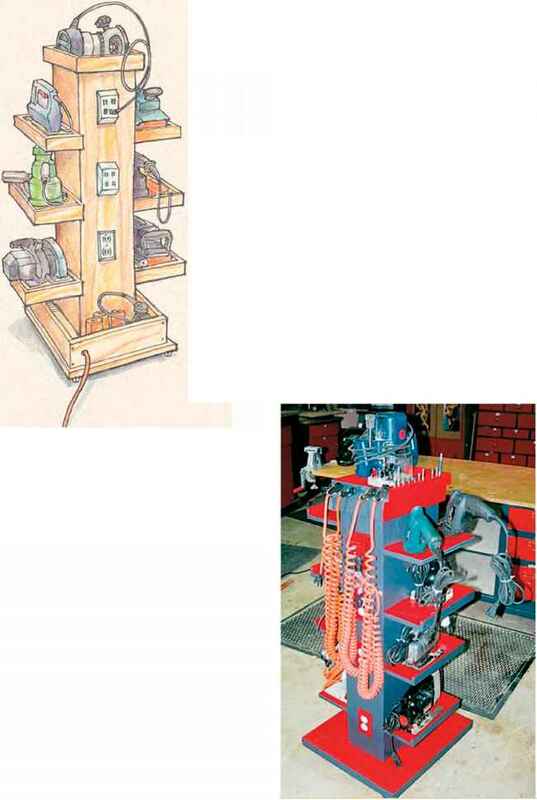 Featuring detailed technical drawings, helpful material lists, and the professional tips, techniques, and advice for success, the Best ofWoodworker's Journal will keep you busy for seasons to come.